This year we decided to go to Austria having only visited the country twice before for a spot of kayaking on the river Inn. This time it was time to get high and admire the view. Like last year we used the Lonely planet guide for advice and guidance. First stop was Kitzbuhel having seen it many a time on Ski Sunday it was a place we had high hopes for! We arrived at a campsite just outside called Bruggerhof- Schwazee. With a tennis court, spa and restaurant on site you could ask for little more. H being a little prudish found the shared naked saunas a little off putting! The weather was very mixed throughout the trip so it was time to have the tourist attractions ready just incase. 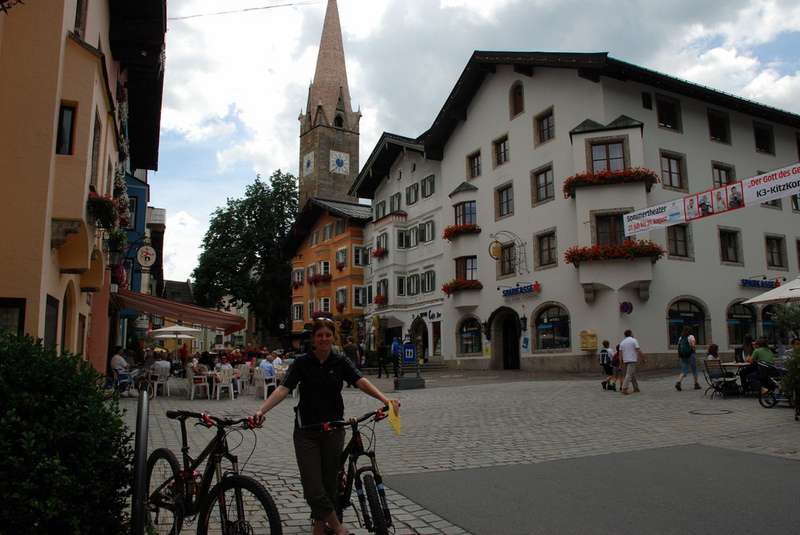 The first day was spent getting our bearings visiting the town of Kitzbuhel. As the weather was set to worsen for a few days we decided to take a trip to Krimml Falls in the Hohe Tauern region. The falls were spectacular and it was a great excursion on a wet day! Once the weather broke 2 days later we decided to take advantage of the many mountain bike trails that exist in the area. We got a map from the local bike shop 'mountain edge' and headed for the nearest cable car the Hahnenkamm. This name has a different meaning to the downhill skiers who fear it on the World Cup circuit. The tour took us on ski access roads over to Aschau. After a lunch stop with a great view we took the descent to Aschau which was very exciting especially when we took a gnarly trail straight down! Roots, steepness and rocks all thrown into one. Once we rounded the valley we took another cable car back up to check out the Ehrenbach trail. This is a famous trail around these parts that will test even the fearless! The trail was everything we thought it would be. 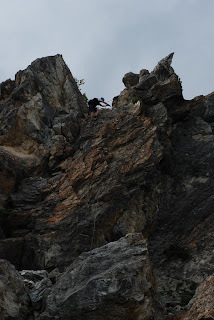 Legs were certainly trembling when we had reached the bottom. After a great ride it was time to pack up and move on. We decided to move onto a campsite in a place called Werfen (camping Vierthaler). The campsite was small and basic but the people were very friendly and the take away pizzas from the bar were a bonus! 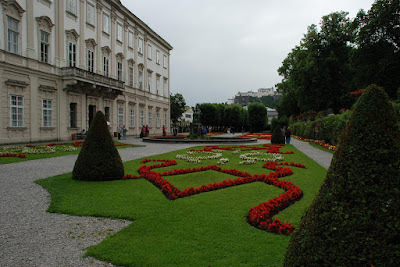 On route we visited Salzburg to check out sites from the `Sound of Music'. 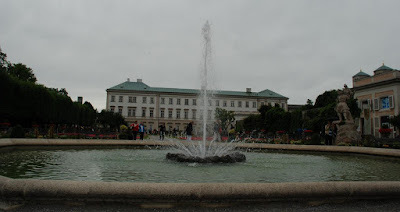 After struggling to work out the park and ride system we headed on the bus to Schloss Mirabell. This was the scene where the children do 'do re mi' around the fountain. We headed across town checking out the Mozart statues and memorabilia. As we headed for the Festung Hohensalzburg for a great view of the city we passed a stunning performance on the electric violin by Jan Tkacic (check out the You tube rendition of Ave Maria). The view from the fortress was stunning. From the fortress we decided to go and view St Peters Cemetery and the Catacombs. The experience brought back all the anxious feelings that we felt when watching the Von Trapps hiding from the Nazis in the film! After enough tourist stuff we decided it was time to go back to our home for the evening. Waiting for the bus H was accosted by a beggar women who only left us alone once I spoke to her in welsh!! After a difficult bus journey lasting over an hour we eventually found the Park and Ride! The next day the weather was still shocking so we decided to visit Eisriesenwelt, billed as the worlds largest ice caves. The drive up was interesting to say the least and then a 10 min walk to a cable car before another 10 min walk. We eventually arrived and K being as impatient as ever suggested we join the German tour! Equipped with a miners lamp and a translated script we made our way through a spectacular maze of caves. The local cuisine was greasy meatloaf and fried potatoes or a fried egg! Driving back to Werfen we had a great view of the fortress where the daily falconry show was happening. As the weather was set to improve we decided to make our way into Germany to check out the Eagles Nest above Obersalzberg. A trip in the brass elevator took us to the Eagles Nest (which was named this by American soldiers after the war) - which turned out to be a restaurant! I was expecting a museum type building, but no, Wiener Snitchel was the order of the day - and very nice too!! There was a bit of a museum with photos in around the side, but it was all in German so not many facts picked up here! We walked up to the top which was very busy and the view was lovely - with Konigsee to the left. It was pretty steep off the top and the drop into the valley was massive, no wonder this was a safe haven! Konigsee with no one else in the shot! Once we had wandered up to the top of the hill and had some lunch, we decided to walk down to the buses rather than take the lift. A pleasant 10 minute walk and we just made our bus! The road back to Obersalzberg is only 4 metres wide and the elevation is 700 metres in 6.5km (with only 1 switchback which they are very proud of!). The road was blasted out of solid rock and took just 13 months to construct. It was a lovely day and once down we decided to see if we could get a trip on the lake, the deepest one in the alps (190 metres deep and 8km long). We booked a ticket and got on the next boat. While we were traveling along, the captain on the boat got out a trumpet (or similar instrument!) and started playing and the echo was incredible. What was more incredible was the fact he then went around with his hat and expected everyone to put money in! Which of course we did, because we wanted to get a ride back too!! We passed St Bartoloma church shown on the right which we thought was out of place on the lake. 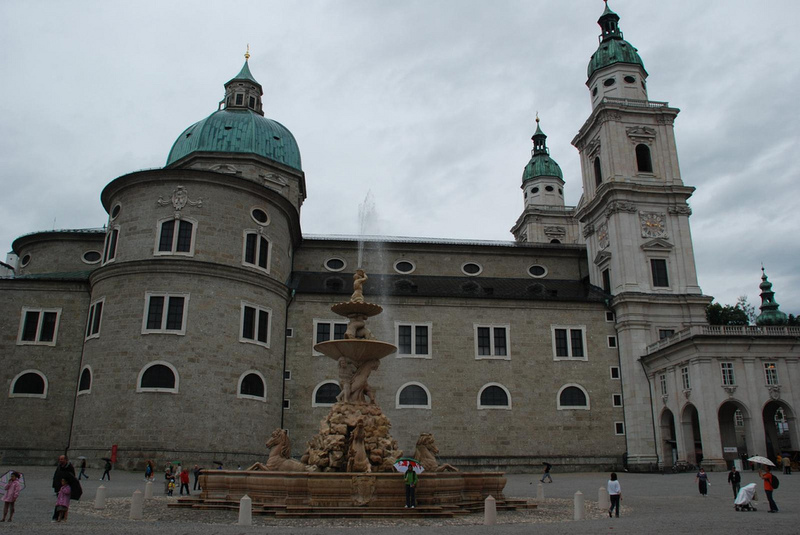 This used to be an old hunting lodge of the Bavarian Kings. 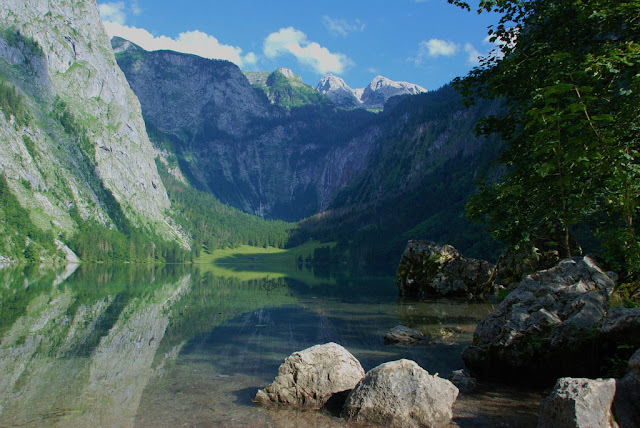 Once across the lake, we walked to Lake Obersee which was very tranquil. Although we didn't have long as we had to get back for the last boat - we didn't fancy staying here all night!! Once back on dry land, we found a campsite - Camp Winkl. We didn't get a proper pitch as it was so busy. But we were happy to be able to stay the night. We found a nice Italian restaurant and had a lovely meal sitting outside on the terrace. 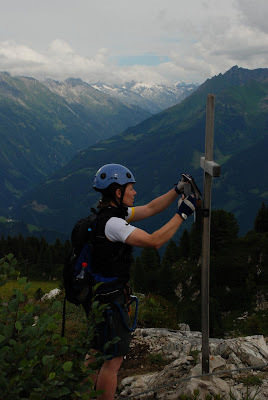 The next day we headed towards Zell am See with a ridge walk planned. The walk was one in the Lonely Planet guide and it sounded like a good one, it was called the Pinzgauer Spaziergang. We parked the camper at the end point in Saalbach and caught a bus into Zell am See. We didn't fancy catching the bus at the end of the walk. We caught the Schmittenhohe cable car after waiting nearly two hours! We were not happy and almost turned around as we knew the walk was a long one and were concerned that we would run out of time. The views at the top were pretty spectacular and we had plenty of photo opportunities. 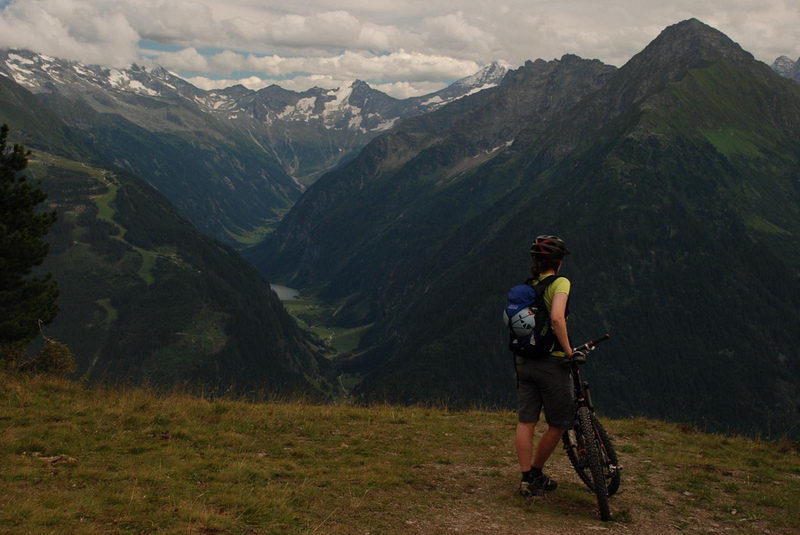 We couldn't help thinking that the route would have been a great mountain bike ride! Still smiling but I think it's a fake one by now! The walk across was 19 km and took around 6 hours coupled by a two hour wait and another 2 hour walk down due to missing the final cable car, this turned out to be a long day!! We caught up with an Australian lady and she joined us for the last part of the walk. She told some interesting stories, not least that she had been in Europe to commemorate the remains of her grandfather who had fought in the Great war who had only just been identified. The lady was doing the same walk from the lonely guide book and was hoping to get the bus back. We gave her a lift! K was panicking as our parking ticket was going to up as we had taken longer than first anticipated. We were about one minute overdue, but luckily no parking attendants were around!! To say we were wasted would be an understatement! Our feet were killing, especially after the 2 hour walk down! We needed to find a campsite, the two in Zell am See were full so we took a risk and kept traveling down the road until we saw a sign. We got to a campsite at about 8.30pm and made food by seconds! That meal tasted so good!! The next day after a lie in, we traveled to Mayrhofen. The town was a lovely place and we had a wander around and took a trip to see the ski jumps. We took the scary cable car (Penkenbahn) with our bikes which went very high above the ground and swung a fair bit! At the ticket office we were given free bottles of drink, which tasted a little like ginger beer. 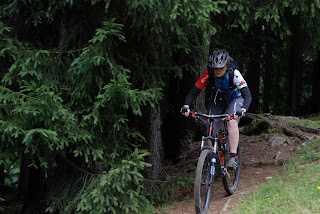 We rode up to Penkenjoch and then we found the downhill track - a man made track which was very steep and was called 'Himmelfahrt'. It started to rain at this point, but we thought it would pass so we huddled under a cable car station. Unfortunately it didn't pass so we just got out and rode and got absolutely soaked! 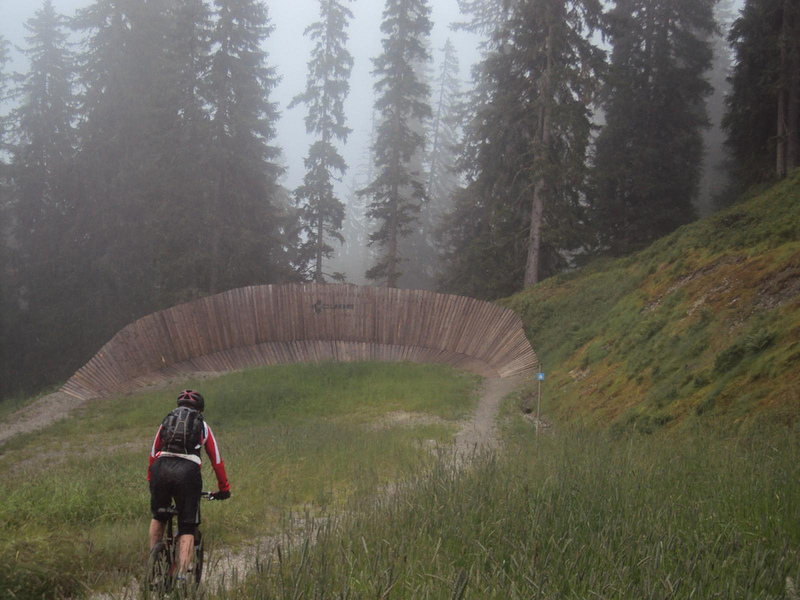 The second singletrack was called 'Hoellenritt'. Some information on the internet said "The singletracks are suitable for varying levels of technical skills and fitness. 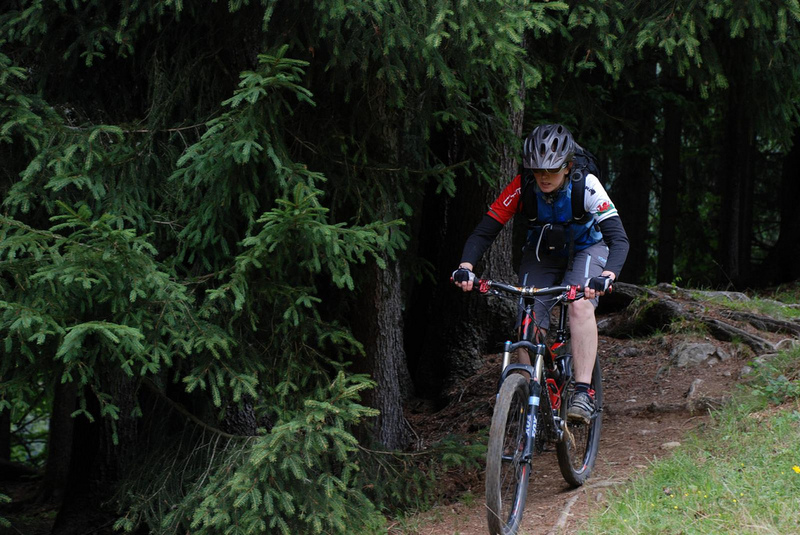 The first is an easy route with some obstacles and the second leads down to the valley and is designed for advanced downhill bikers." After riding some of the knarly trail, we decided to bug out before it was too late! It was really wet and slippery and we didn't fancy any surprises. We looked at the map and took a footpath (don't tell anyone!) which seemed to go on forever (a certain someone was panicking!). We then had a nice grassy descent before joining a fire road and eventually a road and popped out just up the valley from Mayrhofen. The return to the town was nice as it was all slightly down hill. We did get some funny looks when we went into the spar soaking wet and top to toe in mud! The next day seemed like a nice day and we decided to drive up to the Hintertux glacier and visit the Eis palace. 2 cable cars later we arrived at the top to see people skiing, a bizarre site in the summer! We joined the crowds for the walk around the Eis Palace, a maze of ice caves in the glacier. After getting cold in the Eis Palace, we headed back down and got some food at the bottom refugio before heading back to Hintertux. While eating our lunch we were watching skiers trying to get down the last slope which was very patchy and looked very icy in patches. We then had two 'models' running about 5 metres and then stopping with people following them with a camera and a board. It was funny to watch and was obviously a photo shoot for a magazine or catalogue. The woman kept getting her hair put into perfect place by one of the assistants and it was funny to see random people walking behind them (and in the shot) oblivious to what was going on! Lots of change of clothes later and they were still 'shooting' when we were leaving. It was then back to the campsite where I was promised a relaxing afternoon! It was not to be..... and we were soon on our bikes with our via ferrata kit in the rucksacks getting on the Penkenbahn once again! We rode up to Mount Penken, locked our bikes up and headed to the start. 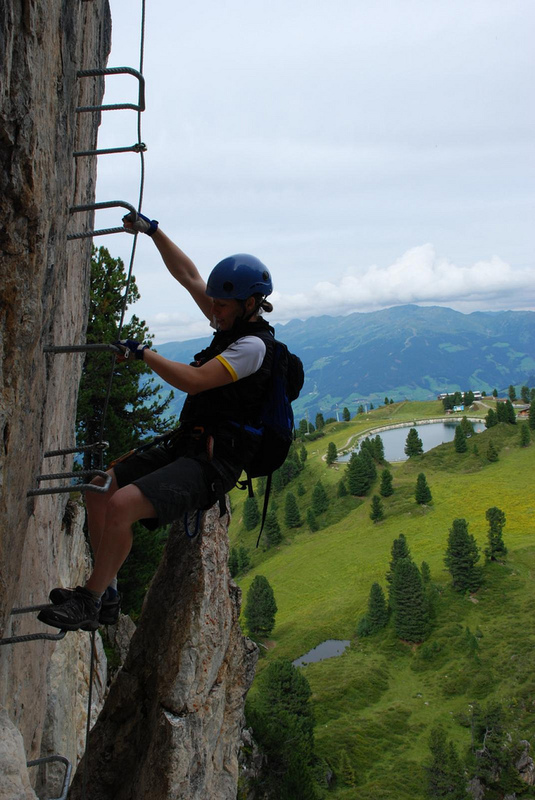 The guidebook said that 'Beginners could get a taste of climbing and discover a true passion for the art of via ferrata'. On reflection this is quite misleading as some of the pitches caused some adrenalin fuelled leg shaking! The first pitch up a ladder was slightly overhanging and made you feel that it was pushing you off! This was fairly tough for the warm up pitch! The view was awesome though! There was not much smiling on the next pitch, another overhanging move with only the shaky cable to hang onto ! 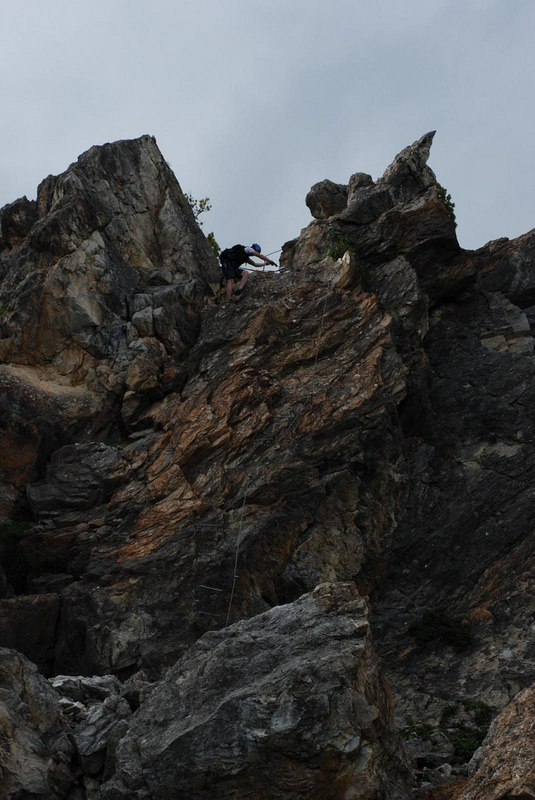 We were actually traversing above climbers here, and they looked very small! I know we're in trouble when I get around the corner and K is nowhere to be seen. This means that she has got across without messing around and it is likely to be a tough one! I wasn't wrong!! 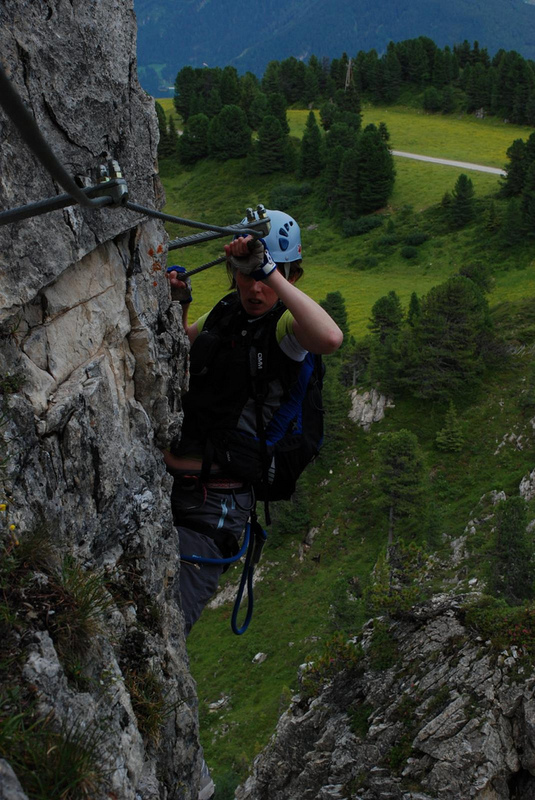 Lets go for a nice easy via ferrata she says!!! 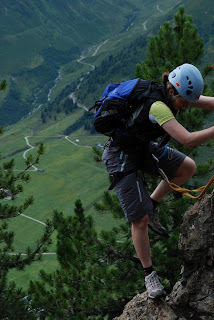 I was pleased to reach the top and K signed the book which is a ritual of all via ferrata's. I'm not sure if anyone reads these books or if they're actually kept, but they probably make for an interesting read with different languages and people noting where they're from! The descent was a lot more gentle and we laughed all the way down! We returned to the start and were grateful to see the bikes still where we left them. A nice descent followed on the bikes back to the Penkenbahn. We rode past the 'funballz' which people had been in when we rode up. The funballz are the big inflatable balls that people go inside and float on top of the water. We headed back to the campsite and packed up ready for the drive home the next morning. On reflection a great holiday with some interesting places giving us some strange experiences!! The weather didn't help but we got the most out of the 2 weeks.